Lingual braces, also known as concealed and/or invisible braces are the best, and only, non-visible form of fixed orthodontic therapy. Concealed braces are placed behind the teeth where they are not seen. Various combinations of these appliances can be employed to achieve the desired correction and the patient enjoys an unobstructed smile during treatment. These appliances are custom-made to each patient and the techniques used require special instrumentation, equipment, doctor and staff training. Most patients are good candidates for lingual braces. A new, smaller generation of lingual orthodontics has less effect on the tongue and speech. While all lingual braces require some adaptation, the benefits allow the cosmetic freedom of a continued career and social lifestyle. Another option is upper lingual/lower ceramic braces for a more cost-effective appliance choice. Treatment time is comparable to that of outside braces and sometimes even shorter. The average treatment length is under two years. Lingual orthodontics are as effective as labial (outside) braces in obtaining good treatment results. In some cases they are more effective than labial braces, such as in expanding narrow dental arches. Lingual braces are invisible. The brackets are placed on the back side of the teeth, and they are not visible from the front. Working just like traditional braces, lingual braces eventually straighten a patient’s teeth within the same amount of time metal braces would. Of course, each patient’s timeline depends upon the specific case. Lingual orthodontics can significantly enhance an individual’s appearance-without the self-confidence shakers of metal braces. Therefore, lingual braces are a great option for both adult professionals and teens who would feel more confident with invisibility-all while managing great dental health. Lingual braces can also be extremely convenient for those who play wind instruments or contact sports. 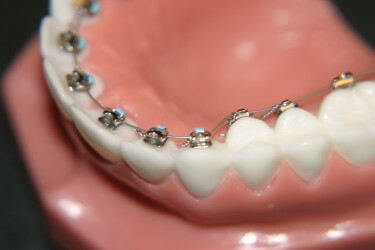 Lingual braces are suitable for patients of any age. Lingual Braces allow you the benefit of developing a great smile correcting the bite without interfering with your appearance. Anyone who needs orthodontic care and cannot compromise their appearance during treatment will find lingual braces to be indispensable. Invisible braces are known to cause speech abnormalities such as a lisp. However, this side effect can be overcome with practice and the use of a wax barrier on the braces. Lingual braces are generally more expensive than traditional braces because they are more labour intensive to install and maintain. Lingual orthodontics treatments tend to take longer than traditional braces due to their placement. It is vitally important to maintain good oral hygiene and since the lingual braces are very closely contoured to your teeth, it is much easier to maintain oral hygiene compared to labial braces. Regular checkups by your family dentist are recommended during the orthodontic treatment period.